And so what if March doesn't start until tomorrow. We're excited about the month that brings Spring. 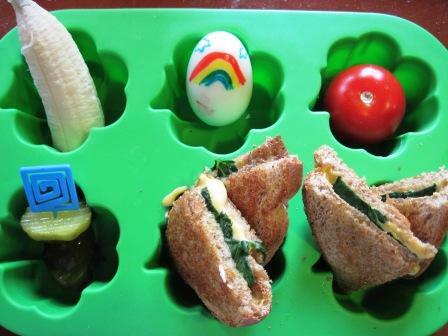 For lunch Pierce had a banana, an egg with a rainbow and clouds on it, a campari tomato, a skewer of pickles, and a grilled cheese sandwich with sneaky fresh spinach inside. He ate every last bite and earned a mini tofutti raspberry ice cream sandwich for dessert. Whenever I draw on eggs I inevitably receive questions. So, as an FYI, I use food writers on the eggs. I draw on the eggs after they have been peeled. The food writers can be found in the baking aisle with the birthday supplies. A set of 4 will run you $3.99 and they are so much fun to use! I love the egg. JDaniel would love the sandwiches. He ate it all? Yay for Pierce and yay for you! A great tin. My middle son loves hard boiled eggs. I cannot wait for spring to arrive. Love the welcome to March tin. I like using those markers too. I need to get some new ones. I think mine are about dried up. LOL! Is the sneaky leprechaun going to magically appear at your house? He always appears at school and messes up things in their room. My kids get a kick out of that. What a fun lunch! I'd eat it all up too! Now? I want a boiled egg! What a cute idea! My daughter LOVES when I use my food writers! She licks off whatever I drew before eating any of her meal! Love the shamrock tin. The rainbow egg is really cute! Makes me so ready for spring! Great MTM! Glad he ate it all!! I still have to get some of those markers... you can do so much with them! The sandwich looks yummy! Love the rainbow on the egg. This is so cute!! The rainbow is super creative. Loving it! That looks like a ton of yummy fun!